The camera is pointed towards the North/East sky. Thank you Kevin! awaiting the final composite! Dark skies! To understand why there are bright streaks of light during a meteor shower, imagine walking on a very windy day into an area with a lot of loose dirt. There is another celestial show, and this one is going on right now. The Perseid meteor shower st. Stunning Perseid meteor shower is at its peak this weekend — don't miss it! Will you be able to see one of biggest meteor showers of the year? Cloud cover in the Wichita area and the moon's light could drown out the Perseids meteor shower. Join the NASA STEM Educator Professional Development Collaborative at Texas State University for free 60-minute webinar to learn about asteroids and discuss NASA resources for studying these indicators of our solar system’s history. Specific applications of these activities will be discussed. This webinar addresses the Next Generation Science Standard ESS1. Online registration required. AMS Event 2579 2017 Meteor streaks over California. Video from Southeast facing Nest Cam August 5, 2017 10:01PM 31 seconds. The Perseid Meteor Shower is one of the most famous meteor showers in the world and is known for producing a high amount of bright meteors. See the Perseid Meteor Shower 2017 live, online, from the comfort of your home. On 12 Aug. 2017 join the Virtual Telescope team! This could well be the month of celestial spectacles in the UAE. After the partial lunar eclipse, it's now time to witness the Perseid meteor shower. This weekend, make sure to crane your necks upward to the night sky, as a Perseid Meteor Shower may well be visible from the skies of Dubai. You don't want to miss the Perseid Meteor Shower on August 11th, 12th and 13th of 2017. Utah has nine International Dark Sky Parks to view it. The Perseid Meteor Shower will be visible this weekend, and you're not going to want to miss it! To best view it, visit Badlands National Park. Cloudy skies, chance of storm, and a close-to-full moon conspire to make it all the more difficult to view the Perseid meteor shower this week. Events in 2017 2637-2017 KML. IMO received one report about a fireball seen over Rhode Island on Thursday, August 10th 2017 around 00:40 UT. 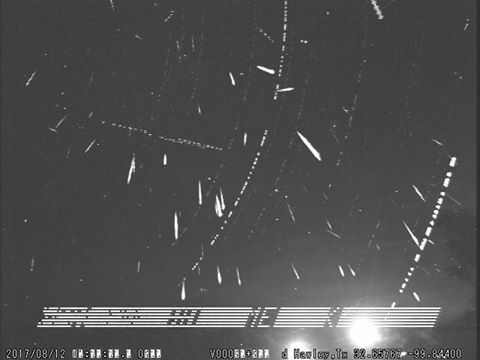 This video has been uploaded on the American Meteor Society Website. AMS Event: 2610-2017, Report (2610n-2017) Credit:J. Gresham. The Perseid meteor shower may be three weeks long, but it's set to peak over Toronto this weekend with one of the best meteor viewings this year. Events in 2017 2617-2017 KML. IMO received one report about a fireball seen over Rio de Janeiro on Tuesday, August 8th 2017 around 20:50 UT. The best time and place to view the meteor shower which could deliver up to 80 shooting stars an hour. What is it, when is it and where can I see Perseid Meteor shower this year? Astronomer Tom Kerrs tell you how you can see this meteoric marvel. People will be able to clearly see the meteor shower with the naked eye, so there's no need to rush out and buy an expensive telescope to enjoy it. JEMEZ SPRINGS – The Valles Caldera National Preserve will celebrate the height of the Perseid meteor shower with a star party Saturday, Aug. 12. Perseids Meteor Shower 2017. FREE ENTRANCE - FREE LECTURE – LIVE MUSIC WITH YURI MELIKOV. PROGRAM. TIME. EVENT. 19:37. The BLAQ Meteor Shower Scrub will set you back $24.95 from Blaq.co. You better get in quick – this other-wordly glow is limited edition. NOT a good idea to be putting Nickle containing meteorite on your face! Perseid meteor shower: When, where and how to watch shooting stars ... A Perseid meteor enters the skyline above Glastonbury Tor in Somerset. IN the next few days leading up to its peak on August 12, the Perseid meteor shower will make its annual appearance in the skies above Scotland. The ESA SSA-NEO Coordination Centre has released the August newsletter summarising the most relevant data and events on asteroids and comets approaching the orbit of the Earth. Please, feel free to forward it to potentially interested people. "I just witnessed a massive fireball under full moon conditions a few minutes ago. It was at a 40 or 45 degree elevation and directly south of the intersection of New Mexico Hwy 528/Pat D'Arco Highway and Kim Rd. Almost Venus-bright point that grew in intensity and finally flashed steadily at the end, with terminal fragmentation very visible. Duration was about two and a half seconds, time of event was 8:52 pm Mountain Standard time. Direction of flight was north to south with an apparent steep angle. I am checking the Sandia Labs all-sky network to back up my report, since it was so recent and happened too fast to take a picture since I was driving. No clouds and as far as I know there was not supposed to be any wind for any where in the south-central part of the state tonight where I witnessed this event. Hopefully something turns up from this one, it was spectacular to see. What did the orbit of the Chelyabinsk meteor look like before it entered the Earth's atmosphere? The orbit of the Chelyabinsk meteor has been reconstructed by two researchers in 2013. A video shows that its orbit was situated between Earth and Mars. The annual Perseid meteor shower is set to reach its peak over Scotland this month, giving amateur stargazers a potentially dazzling celestial show. Attention stargazers Irish skies are set to be illuminated later this week as a spectacular meteor shower is expected to grace the night's sky. The annual Perseid Meteor Shower will take place on Saturday, August 12th, at the Dominion Radio Astrophysical Observatory (DRAO) in Kaleden. Night Sky Photography Workshop Featuring the Geminid MeteorShower on Dec. 13, 2017! Night Sky Photography Workshop. in Banff National Park Featuring: The Geminid Meteor Shower. Aurora over Mount Astley, Banff National Park. The Perseid meteor shower should be at its maximum late tonight and late tomorrow night. The nearly last-quarter Moon will light the sky late at night. Despite wild media reports about it being the brightest meteor shower in human history, NASA said "no such thing is going to happen.". When are the best times to see the Perseid Meteor Shower 2017? The best summertime meteor shower — the Perseids — will be coming to a sky near you next week, weather permitting. This event combines the potential to witness a meteor shower under ideal conditions with an opportunity to sleep beneath the stars in Colwood. Watch the Perseids meteor shower with the Hamilton Amateur Astronomers at the Binbrook Conservation Area from 8 to 11 p.m. on Friday August 12. What was that fireball in the sky Saturday night? NASA drill for the end of the world? The Perseid meteor shower is one of the most spectacular celestial events of the year and can see 100 shooting stars in the skies every hour. State parks across Michigan are offering “Meteors & S'Mores” shooting star parties for annual Perseid meteor shower. Watch the annual Perseid meteor shower from a canoe or kayak. The program will end with hot dogs and s'mores by a fire at the water's edge. Jay Sullivent heard a loud boom coming from outside of his home and when he went to inspect it, it was without a doubt a flaming meteor. HOAX! Total BS! Sterno used to fake. Meteorites do NOT burn, nor are they even hot. A stunning solar eclipse and the annul Perseid meteor shower along with a parade of planets promise to put on quite a sky show for onlookers. If the sky permits, the famous Perseids meteor shower will be observed with its peak in the late evening and early morning hours on August 12-13. This brief guide will get you started on shooting the upcoming Perseid meteor shower, the Milky Way, and "Deep sky objects" like galaxies. "Right now I can't say with 100 percent certainty that it was a meteor," Mike Hankey, operations manager for the AMS, told Inverse. "I'm more like 95 .